Rugelach (also spelled Rugalach or Ruglach) is normally a crescent-shaped, bite-sized East European cookie made with a cream cheese flavored dough and filled with ground chocolate, jam, poppy seeds, dried fruits and/or nuts. For this Rugelach recipe, however, we are not going to make cookies. 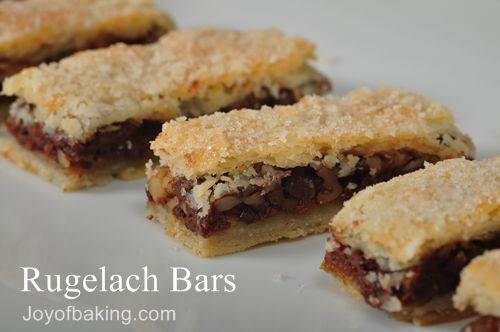 Instead we are making a large pan of Rugelach Bars which is easier to make and is great for large gatherings or to take to a bake sale. Rugelach dough is different from other types of pastry in that it contains cream cheese which adds a nice tanginess and makes it very easy to work with. Once the pastry is made it is divided in half, chilled, and then rolled into two rectangles. One rectangle is put on the bottom of your pan and then the filling is evenly spread over the pastry. The filling contains ground chocolate, nuts (pecans or walnuts), chopped dried apricots, orange zest, and a hint of ground cinnamon. If you do not like apricots, you could use raisins, dried cherries, or even dried cranberries. Once the filling is placed in the pan, we then place the second rectangle of pastry on top of the filling. Brush the top of the pastry with an egg wash and some sugar and when these gems come out of the oven, you have a buttery crisp pastry enclosing a delicious filling. Cream Cheese Dough: Place the cold butter and cream cheese in the bowl of your electric mixer. Mix on low speed until the cream cheese is broken down but the butter is still chunky. Add the flour and salt and, on low speed, beat until crumbly and just beginning to hold together. (There should still be some small pieces of butter visible in the dough.) Divide the dough into two equal pieces. Flatten each piece of dough into a rectangle and wrap in plastic. Chill in the refrigerator several hours or overnight. Next day make the chocolate filling. Chocolate Filling: Preheat oven to 350 degrees F (177 degrees C) and place the rack in the center of the oven. Place the walnuts or pecans on a baking sheet and bake for about 8 - 10 minutes or until lightly browned and fragrant. Remove from oven, cool, and then finely chop. Set aside. In the bowl of your food processor, pulse the chopped chocolate until very finely chopped. Transfer to a large bowl and stir in the chopped nuts, sugar, ground cinnamon, dried apricots, orange zest, corn syrup and melted butter. Set aside. Have ready a 9 x 13 x 2 inch (23 x 33 x 5 cm) baking pan that has been lined with parchment paper. Remove one rectangle of the dough from the refrigerator and, between two 9 x 13 inch (23 x 33 cm) pieces of waxed paper or parchment paper, roll the dough into a rectangle that is the size of your baking pan. Line your pan with the rolled out dough, trimming as needed. Spread the chocolate filling over the dough. Remove the second dough from the refrigerator and roll it out the same as the first. Place the rolled out dough on top of the chocolate filling, trimming the edges as needed. Mix the egg yolk and water together in a small bowl, and brush the top of the bars with the glaze. Sprinkle with sugar. Bake in a 350 degree F (177 degree C) oven for about 35 minutes or until golden brown. Remove from oven and place on a wire rack to cool. Cut into 1 x 3 inch long bars (2.5 x 7.5 cm). Stewart, Martha. Holiday Cookies Magazine. December 2001 Issue.